Our goal is to help you find your wedding dress! We want your shopping experience to be personal + intimate.To create this environment, we only take one bride at a time in our bridal room. This means, if you try to walk-in while there is already an appointment scheduled, we may not be able to see you at that time. For that reason, appointments are highly reccommended during the week and required on Saturdays. Q. HOW MANY PEOPLE SHOULD I BRING AND HOW LONG SHOULD I PLAN ON BEING THERE? We recommend limiting your entourage and only bringing those vital people in your life that you simply cannot make this decision without. For some brides this might mean coming and browsing alone first and for others it could mean bringing a handful of loved ones. Please keep in mind that we do have limited seating in our bridal suite. While we know this is an exciting time and you may want to include all your besties, try and limit those you bring to the ones who know you and your style best, and who will support you in that. Remember, the more people you bring, the more opinions you invite and receive. Q: WHAT SIZE SAMPLES DO YOU HAVE TO TRY ON DURING MY APPOINTMENT? We carry bridal gowns in a variety of sizes ranging from 2-26. All of our designers have very different fits and every sample will fit differently. 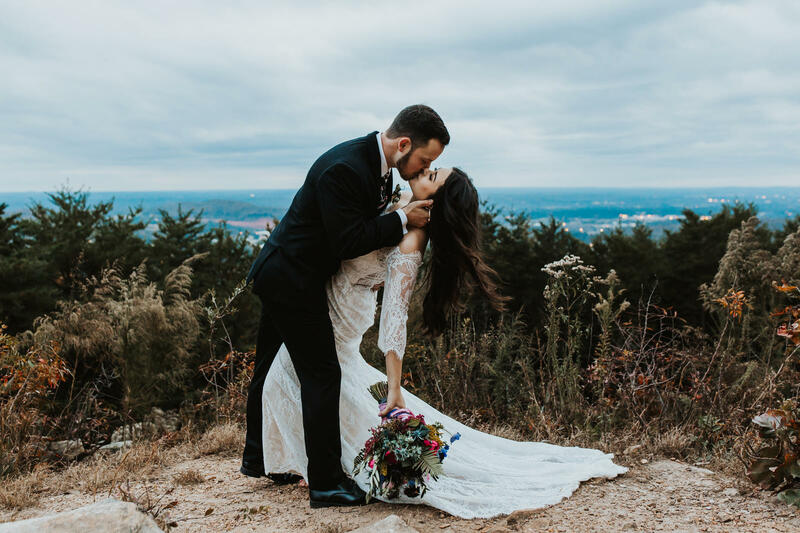 We understand it can be overwhelming trying to envision your dream dress when the sample that you try on does not fit perfectly, but we have all sorts of of tricks to help you get the closest vision possible of what you will look like on your wedding day. We have a pedestal to try on for length and clips of all sizes to tighten the fabric. We help brides of all shapes and sizes each day, and we are confident in our ability to help you choose your dream dress too! Q. HELP! MY WEDDING IS IN A FEW MONTHS, CAN I STILL GET A DRESS? Absolutely! All of our sample pieces in store are available for purchase straight off the floor. We also have lots of dress options that are often ordered with quick turnaround times for a minimal rush fee! Q. I JUST GOT ENGAGED AND MY WEDDING ISN’T FOR AT LEAST ANOTHER YEAR, WHEN SHOULD I START SHOPPING FOR MY DRESS? In order to have the best experience with the most options, if time permits, we recommend shopping somewhere between 6-10 months or more before your wedding day! All of our gowns are made to order. Therefore, our designers do not begin cutting fabric until you have placed a half down deposit to have your dress ordered. Plus, the earlier you pick your dream dress, the less there is to stress about! You will have more time to focus on the smaller details of your wedding and/or kick up your feet and relax before your big day! We select the gown size based on your measurements, but we can pretty much guarantee that your dress will need alterations to get the best fit. 90% of the time, alterations are a must to ensure the dress fits you proper. We don't provide alterations in house, as we know that there are experts who have the best equipment and skills to assist with the alterations. But don't fret! We're happy to make recommendations for local seamstresses in our area, but you are not at all required to use our recommendations. Q: WHEN SHOULD I ORDER MY VEILS AND ACCESSORIES? This question is a little trickier, as this entirely depends on the designer and look you are trying to achieve. We do have many veils and accessories that can be sold right off the rack (and most of our brides love this quick option!). They can be purchased and taken home in the same day. Who doesn't love that convenience? However, we do have veils and accessories that are made to order, and are not in stock to sell directly off the rack. Standard production time for our veils is typically 7-10 business days, but specific designers can sometimes take a little more time and a little more love to perfect your veil and/or accessory. Our recommendation is to communicate with your stylist at your appointment. Our ladies are more than knowledgable on all things accessory and are more than happy to give you the most accurate timeline for your specific look. Q. WHAT IS THE PRICE POINT OF YOUR GOWNS? Our gowns start right around $700 and go up from there. There will always be a large selection of gowns between the $1,100-$1,400 range but we do also carry some designers that are priced at a higher price point of $1,700 and up. For our brides with a lower price point, we always have a clearance rack of samples that can only be purchased right off the floor, and are always marked 20% off or more. Can we get a "YES" for a great discount? No matter your budget, we promise we will honor it and do our best to find you a gown that you can't live without!